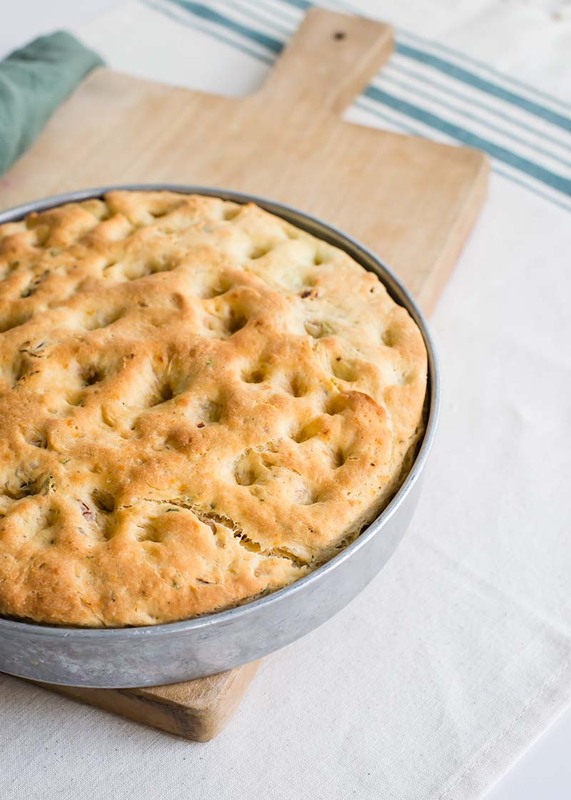 A savory gluten-free focaccia with sun-dried tomatoes, garlic, and Italian herbs. Perfect for dipping into balsamic and olive oil. Add all ingredients to a large bowl. Whisk to combine. In the bowl of a stand mixer fitted with the paddle attachment, beat together the eggs, ¼ cup olive oil, honey, dried herbs, vinegar, salt, garlic, and pepper. Add the yeast and mix on low until combined. Turn off mixer and add the gluten-free flour all at once. Turn mixer on to low speed and mix well. The dough should be pretty sticky. Turn off mixer and scrape down the sides and turn mixer back on to low speed. Add the sun-dried tomatoes and raise speed to medium-high. Continue beating for about 3 minutes. Turn off mixer and let dough stand 5-10 minutes. It will thicken a bit as it stands. Pour 1 Tbsp olive oil into a 9-inch round glass or metal cake pan. Tilt to cover the bottom and sides. Transfer the dough to the pan and turn it over to coat the other side with oil too. Use your hands to pat the dough into an even layer. Pour the remaining 1 Tbsp olive oil evenly over the top. Cover with plastic wrap and let rise for 45 minutes. Preheat oven to 400°F while the dough rises. Can this recipe be made with white or wheat flour? This recipe was tested using gluten free flours. You can definitely experiment using white/wheat flour and see how it works. You’ll need to knead the dough and maybe add in a rise before shaping. Check out our website for other focaccia recipes: https://redstaryeast.com/?s=focaccia.